Product Consists : You and Me Photo Wooden Frame (Photo Size :15cm x 10cm) along with Laughing Buddha Statue. On this Mothers Day take a moment to send your mother a unique lovable message that will remind her of how much you love her Warm wishes for a Happy Mothers Day. Create a wonderful collection of gift for Mom that is as fabulous and unique as she is. 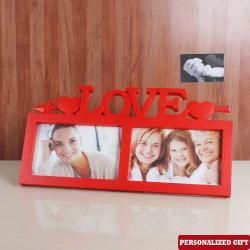 Create a magical memorable moment by sending You and Me Photo Wooden Frame for your loved ones. 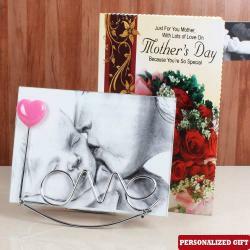 Browse your photo gallery for that special click which you want to gift on this Mother's Day. This is an incredible and good luck gift items for your loved ones. Laughing Buddha Statue is known as good luck charm, so it will protect your mom from every negative activity. This can be used as a decorative piece like for your living room, hall or bedroom it gives attractive look of your place. Apart from decorative purpose, it is also known for a brilliant choice gift that can be presented to your near ones on their auspicious occasions. It is a versatile casual gift which can be gifted in any season at any time. Photos Frame which are liked by all age group people. 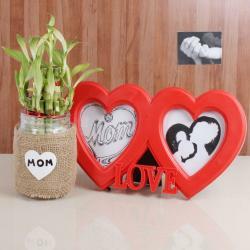 Say Happy Mother's day and make your Mom feel special by sending this perfect gift to her on any special occasion Like Mother's Day, Valentine's Day, Birthday, Anniversary and Many more. This gift is exclusively available at Giftacrossindia.com only. Browse your favorite products, it is very conveniently available for online shopping from anywhere in India with Free Shipping.